Recently there has been a big jump in participation in the free online meditation and yoga classes that are offered here on Mastery of Meditation and Yoga. This is of course wonderful, as the primary mission of this website is to help teach meditation and yoga to all who are interested, and not allow money to become a factor in one’s spiritual and personal growth. So if you have been enjoying and gaining from the free online classes and programs, please help spread the word so that even more people can participate and benefit . A little over a year ago I launched the Free Learn How to Meditate | Beginner’s Meditation Class, and I think now is the right time to launch an advanced meditation class. Like all the other classes and programs here on Mastery of Meditation, this class will also be free and available online for all to join. This class will be part of the Free Online Yoga & Meditation Classes that are offered here on Mastery of Meditation. To learn how these Yoga & Meditation classes are structured, you can watch the video on the Free Online Yoga & Meditation Classes page or read the Free Online Yoga & Meditation Classes FAQ. In brief, this page has links (which are in green) to all the free instructional meditation videos and online meditation articles you will need to complete this course and master meditation. You may start the class anytime you wish and to register, just leave a comment in the comments section below. You do not require anything more from me in order to join and participate in the class. If you are inspired, just start. From the time this website was launched, it has played host to the Silent Mind Meditation Program. That meditation program is very comprehensive, and like the other courses offered here, it too is free of charge and fully available online. At the heart of the Silent Mind Meditation Program, is the Silent Mind Meditation Technique and this advanced meditation technique, makes up the core practice in this meditation class. So if you want to do a comprehensive meditation program, you can do the Silent Mind Meditation Program, but if you are ready for advanced meditation and only want a taste of what that is like, you can simply do this course now. If you are new to meditation, and are looking for a meditation program with instructional supervision, then you can opt to sign up for my Learn How to Meditation Program. The Free Advanced Meditation Class uses the videos from the Free Online Guided Meditation Videos, and free yoga breathing exercise videos, from the Free Online Yoga Breathing Exercises Videos. The links to the specific videos used by this class are in the syllabus below. This course is designed for 2 weeks, but meditation should be a lifelong daily practice for you. The great benefits of meditation come from regular practice, and that holds true for beginner meditations as well as advanced meditations. In this post I will provide the program objectives, details, syllabus and participation guidelines. Please read through everything carefully so you will be able to get maximum benefit from the program. If you have any questions regarding the Free Online Advanced Meditation Class, please feel free to email me at anmol@anmolmehta.com. Master the Art of Meditation. Still the mind of thoughts. Experience bliss, peace, beauty, joy and infinity. Uncover “Big Mind”, “Christ Consciousness”, “Krishna Consciousness”, “The Higher Self”. Develop intuition and intuitive thinking. Discover your true calling and true path in life. Reduce stress and assist in self-healing. Develop the Witnessing Consciousness and Moment to Moment Awareness. Each day’s session consists of 2 sections: Advanced Yoga Breathing exercises (pranayama) and Meditation Practice. The total time for this class is approximately 40 minutes – 1 hour / day. The following describes the 2 sections comprising the 40-60 minute daily breathing and meditation session for this class. 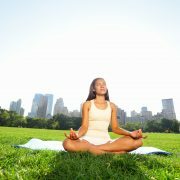 Each breathing exercise and meditation technique below is a link to the article with all the details you need. Supreme Yogic Breath for Brain Development and Mind Control: Supreme Yogic Breath or 1 Minute Breathing is excellent for helping you settle the mind down and prepare it for meditation. This is an advanced breathing exercise and should not be practiced by beginners. If you are a beginner please do the modified versions of this technique. Start with 5 seconds and build up slowly to the full 20 second cycle. Please note that at least 30 minutes is recommended to give this meditation a chance to work for you, so you need to be able to sit still for that amount of time for this class. Silent Mind Mediation Technique: After you complete your breathing exercise, you should feel your mind calmer and more steady. Then begin the meditation practice. Since Silent Mind Meditation requires you to comprehend your thoughts from moment to moment, it is easier to do after the mind calms down a bit. So if you have a more basic meditation which helps you do this further, such as Mantra Meditation or Breath Meditation (Zazen), go ahead and use that for the first 5-10 minutes of your meditation session, until you are ready to attack the thinking mind with SM. Do read the details of the SM technique from the articles and watch the required meditation videos as well. Understanding what is required of you is essential if you are to master this advanced technique. Please note that SM is not easy to do, after all this is an advanced meditation class. It is not complex, but it is arduous. So be prepared to give it your all. The most important thing is to give it your best each time to you sit to meditate. The thing about meditation, is that even if you don’t see the results right away, it is still transforming you slowly and over time you will find yourself happier, healthier and more in touch with your true self and Divinity. If you are passionate, breakthroughs will come. Please post all comments, questions and feedback in the comments section of this post. This way all will benefit from the discussion. Feel free to ask questions or discuss issues, as that is one of the main reasons for this particular class format. Of course, you are free to email me as well if you would like the discussion to not be public. I wish you all a wonderful learning and transforming experience. Practicing Meditation is without a doubt the single greatest factor in helping you discover your True Self and live your life at your Highest Potential. If you have any doubt about whether or not to start such a meditation practice, just go ahead and review the benefits section above. That should be more than enough to inspire you to jump in. Please sign me up for the advanced class. Thank you. 2 weeks of this class done… I’ve found some interesting things about myself when I am mindful of the ways this meditation proved challenging. It has definitely helped in my self exploration. Today was my 9th day of this class. I feel like I am able to crystallize a lot better during the silent mind meditation at this point. I have now finished 8 days of this course. One week of this class is now complete for me. I have completed my 5th day with this class. I have now completed 3 days of this class. I felt a bit of a breakthrough today, but my goal is to hold in the full meditative state for longer periods. I have completed my 2nd official day going through this class. I’ve been working the past few days to get this meditation down. Still working at it, but it is definitely a challenge.